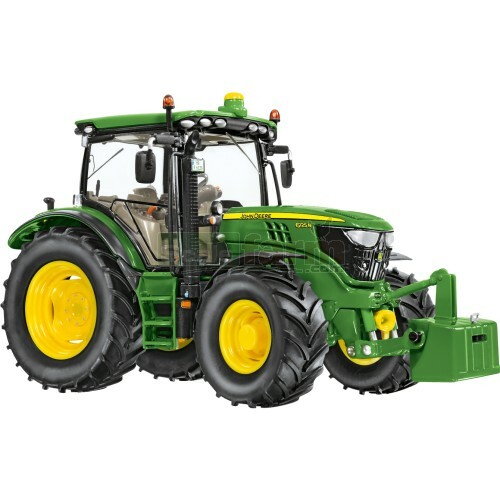 Detailed die cast metal model John Deere 6215R tractor with enclosed cab, interior, pipe, cable and decal detail, opening cab doors and windows, fold out wing mirrors, opening engine bonnet, front wheel steering, removable weight, front and rear 3-point hitch and rolling wheels with tyre tread detail. Note the tractor hitch is not fully compatible with other brand 1:32 scale implements. Hitch adaptor (Wiking 7387) now available.